The natural light has vanished for the evening, I’m fulfilled, having been granted an open day to paint thoughtfully, and now have a clearer sense of how I wish to finish out this composition. 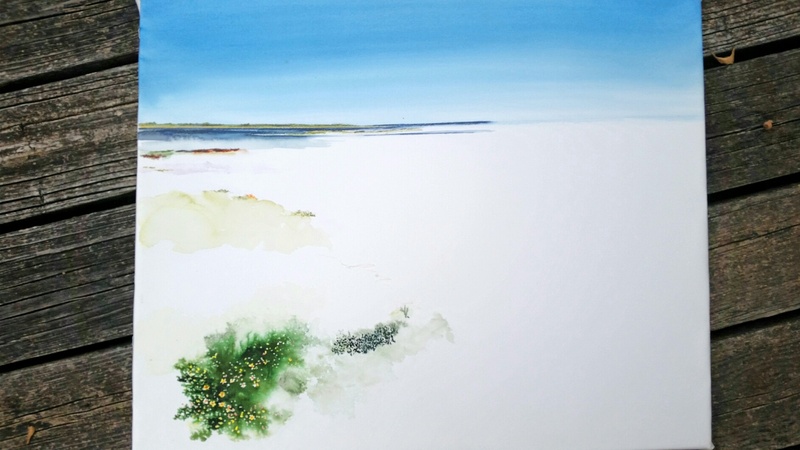 This has been a revelatory experience for me, weaving layers of transparent wash, drybrush, and pencil drawing over the terrain of this island. It is taking a great deal of time, but I am in no hurry. There is a deep-seated contentment I feel as I work slowly over this project. “Home” means so many things. On the most basic level it’s simply a location, the place where one lives. It’s also the physical structure, the house or apartment that is home. Last, home refers to the environment that’s created inside that structure, a world-away-from-the-world offering refuge, safety, and happiness. It’s this last idea of the home as sanctuary that’s absent from most thinking and decision making about technology. Saturday could not have come sooner for me. The first week of school was exhausting, but successful, and by the time Friday evening arrived, I saw the weekend as a luxurious gift. 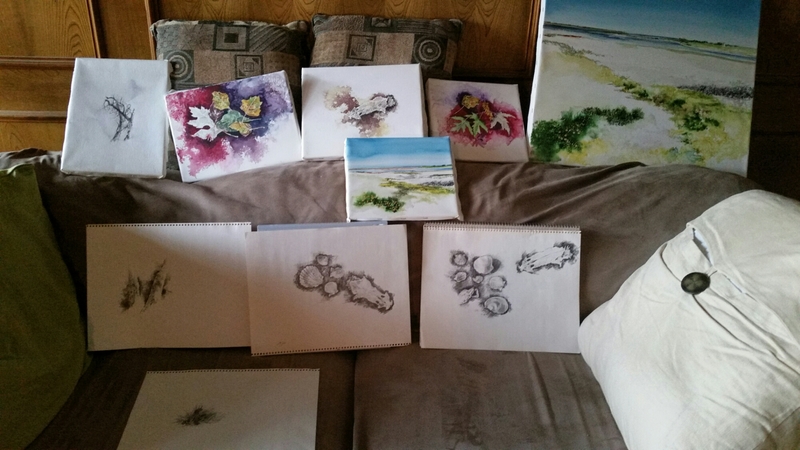 I spent hours in a comfortable reading chair last night, enjoying my journaling and reading, while looking up occasionally at my recent artwork tossed all over the sofa across the living room from me, and feeling a sense of accomplishment. I am loving this book by Powers that I have nearly finished reading. The current chapter is over Thoreau, and how he fled the modern telegraph and railroad sensations to live quietly in Walden woods. I feel that my home is an escape from the daily flood of data and deadlines that harry me throughout the school weeks. Home offers shelter in the evenings and weekends, and a chance to feel that I have gotten back to my real life. Reading this book has been a godsend, because the author discusses ways to keep social media from driving your daily agenda, hence taking over your life. Since I started reading it, I have become painfully aware of how much time daily I have given to facebook, texting, email, blogging, etc. and less time to reflection over what I actually want to do with my life. The book has been a precious gift, and William Powers has offered us genuine spiritual wealth in his writing. 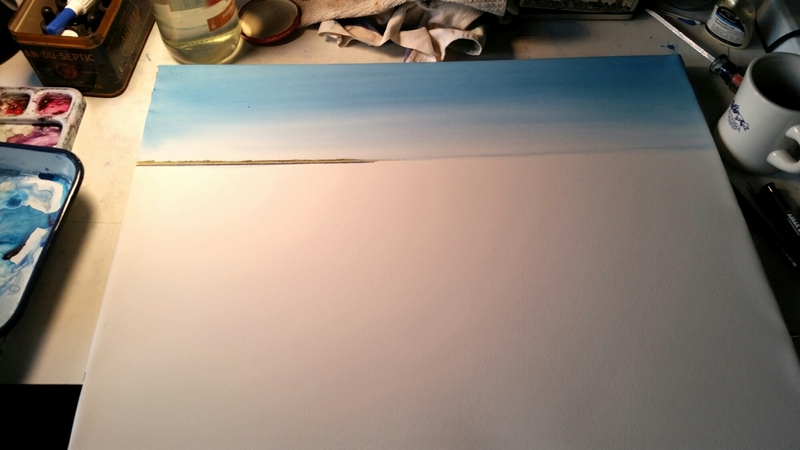 Today, I am hoping to go deep into this painting that I started this past week. Daily I feel the call that it puts out to me, and I want to engage in growing it to its fulfillment. Thoughout this first week of tempestuous school activity, an interior island calm has resided in my depths, and now in the waning light of Friday afternoon I pause in gratitude for that Presence that has convinced me that things are good. With no appointments for awhile to spur me to response, I have enjoyed an afternoon and evening of exploring this new watercolor composition. Thursday evening has offered me a luxurious gift–I was ready for tomorrow’s classes by early afternoon, and had time to paint in the studio with quality light coming through my windows. All day throughout my classes I envisioned this painting I began, knowing what I wanted to do next with it. 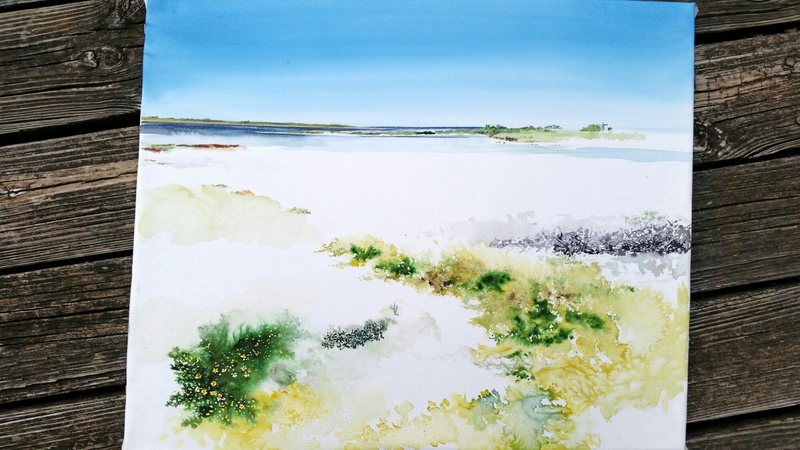 I love Andrew Wyeth’s description of his drybrush watercolor process as similar to weaving a tapestry–he said if you drybrushed on white paper, the painting would be too harsh, too abrupt. He preferred to lay down a light wash, then drybrush over the top of it when it dried, then lay down a wash over the top, apply more drybrush, etc. I have done this repeatedly in rendering the weatherbeaten sides of buildings, and have made a few forays into landscape with the technique. But this will be the first time working on a larger piece (20 x 24″) that is exclusively landscape, with no props such as architecture to take the eye away from the land textures. I am continually layering drybrush and wash, one atop the other, and the land is starting to take on a richer complexity and texture. 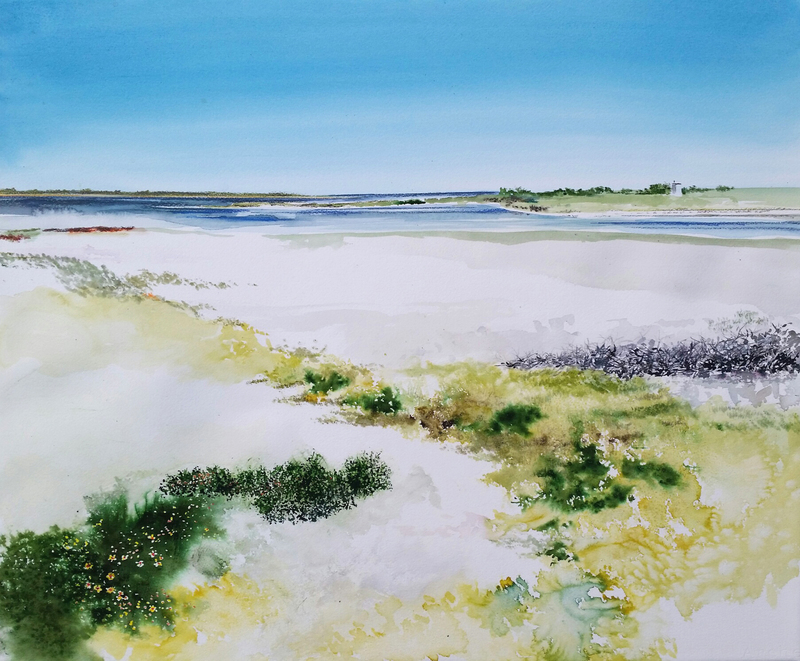 The layout of the island where I stayed last June on the Laguna Madre becomes more fascinating to me in these months following, as I look at photos I took, sketches I did on location, and study closely the textures and colors of the various plant life and sand colors. This time, I am really trying hard to match the colors as best I can. Of course, I want to make a pretty painting, but I want this watercolor to be truer to the colors I saw on location, and the process is requiring plenty of experimenting and scrutiny. And I love the process. I am hesitant to toss this photo up on the blog for two reasons: 1) I have gotten further along, but it is now dark, and my photography of my large watercolors under artificial light is awful, 2) the painting is coming along like a jigsaw puzzle, as my plan is to develop that serpentine line of ground textures from the foreground to the lagoon. Currently there is still a great deal of white paper surface that has not yet been touched, and there is no quick way for me to get that done. All in good time. Rising at 5:30 instead of 5:00, I thought I would skip the drawing exercises and just go straight to breakfast. Apparently, I have already established some kind of a habit, because halfway through breakfast I absent-mindedly reached for the pencil and sketch pad. Before falling asleep last night, I wondered about how to render the grass patterns on my most recent island painting in progress. I figured this morning that if I concentrated on black and white, and just worked on value studies across the land masses, that I might have some kind of breakthrough. 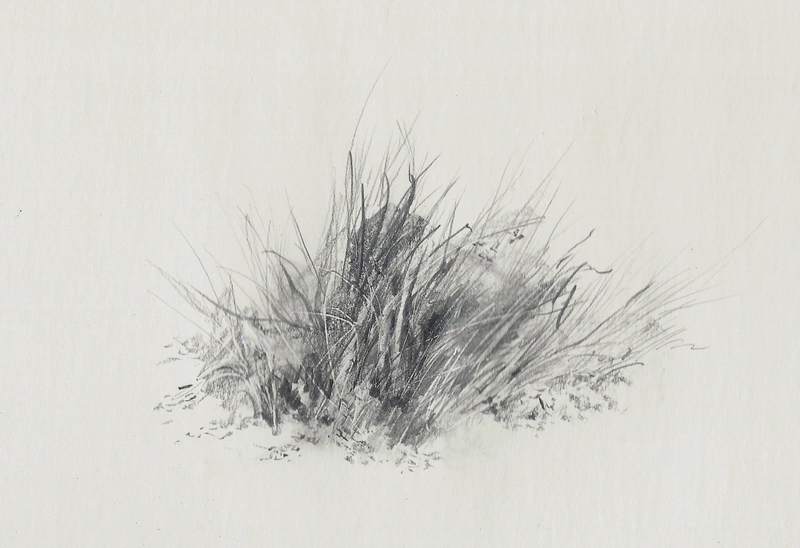 So, this is my first attempt to render grass, clusters of weeds, and wildflowers with just blacks, whites and grays. Thank you for reading, and spending part of the morning with me. 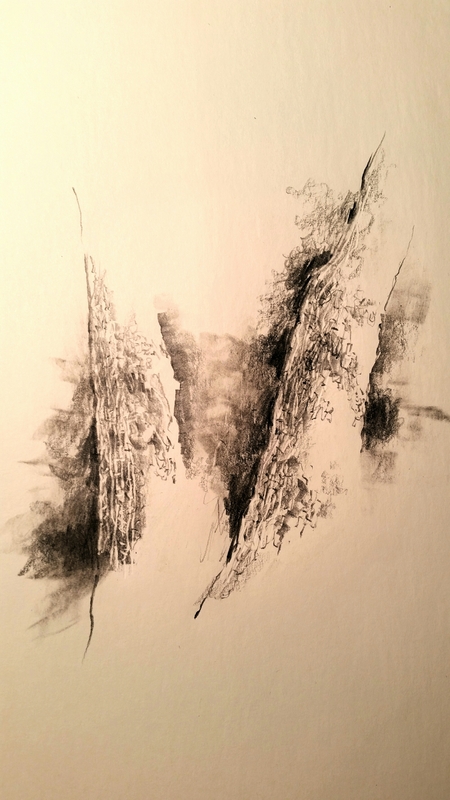 Before retiring to bed tonight, I had this compulsion to sketch a little more, experimenting with tree bark textures. The left trunk was already posted earlier; the right one has now been added. 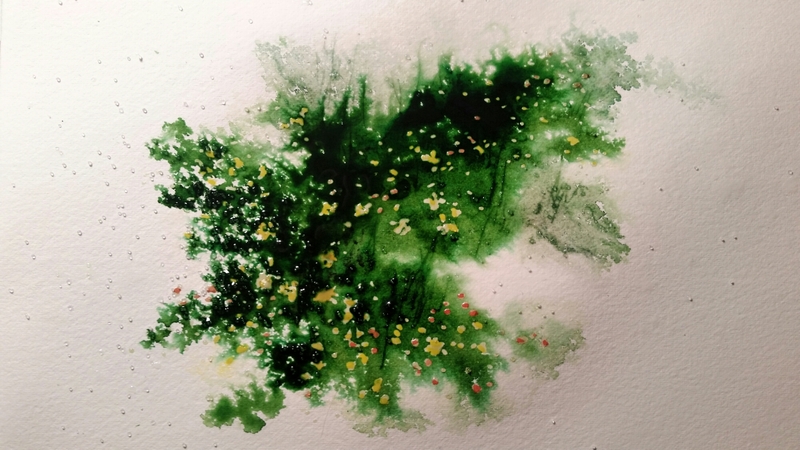 The watercolor activity is coming slowly. This is a larger piece than what I’ve worked on most of this summer, and I am trying to work out a scheme where I can build a serpentine line of terrain from the lower left corner ultimately to the lagoon in the distance. Having finished my first full cycle of high school classes, I feel like the quarterback facing 2nd and 4. I believe I can make the first down. Monday featured three 90-minute classes of Advanced Placement and Regular Art History classes. Today was two A.V.I.D. classes and one Philosophy (each one 90 minutes). Having taken the summer off from teaching, I can honestly report that I am totally trashed-out and exhausted, but believe I will hit my stride pretty soon. Yesterday and today, I managed to kick out the planning for the following day, leaving myself some afternoon and evening hours for watercoloring and drawing. 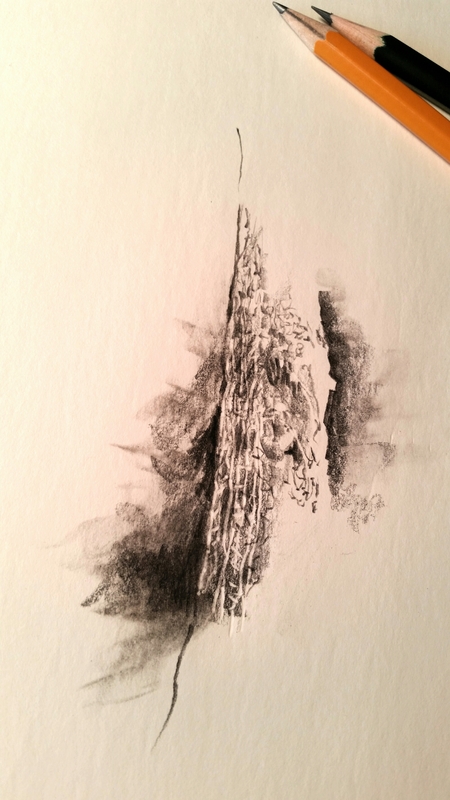 Above is a sketch I just attempted of a tree trunk, using several grades of pencil along with a blending stump and that dried-out ballpoint pen for impressions in the paper. I’m trying to find a way to simulate the graininess of the bark and somehow make the tree stand apart from a background. I’m still experimenting, but just love the feelings that accompany drawing for pleasure, or in this case, decompression following frenetic daily schedules. I who sail now in a boat, have I not sailed in a thought? The hardest material obeys the same law with the most fluid. Trees are but rivers of sap and woody fibre flowing from the atmosphere and emptying into the earth by their trunks as their roots flow upward to the surface. And in the heavens there are rivers of stars and milky ways. There are rivers of rock on the surface and rivers of ore in the bowels of the earth. And thoughts flow and circulate and seasons lapse as tributaries of the current year. As I lingered over his words, I thought of my own life as a river that flowed eventually south into the Texas Laguna Madre, settled there awhile, and then reversed its course back to the metroplex where I now try to share my vision while down there. The river is a marvelous metaphor for the life of the mind. How many times could we describe our individual selves as rivers of ideas, each of us pushed on our unique course by a passionate heart that pumps that energy throughout our bodies? Or better still, could each of us not represent a single tributary, branching from the same source and pushing on our individual odysseys? Meandering rivers. Splintering tributaries. All of us beautiful in our own way. For about half an hour this morning, I enjoyed the flow. 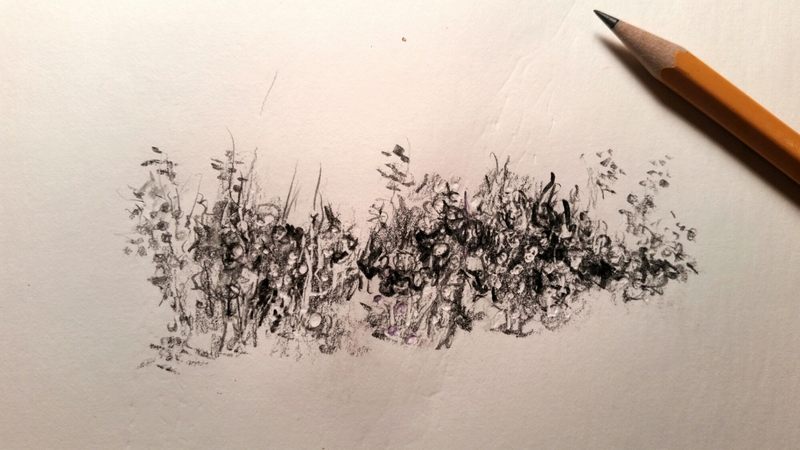 Taking up the pencil, I decided to push my experiment a little further down the river. 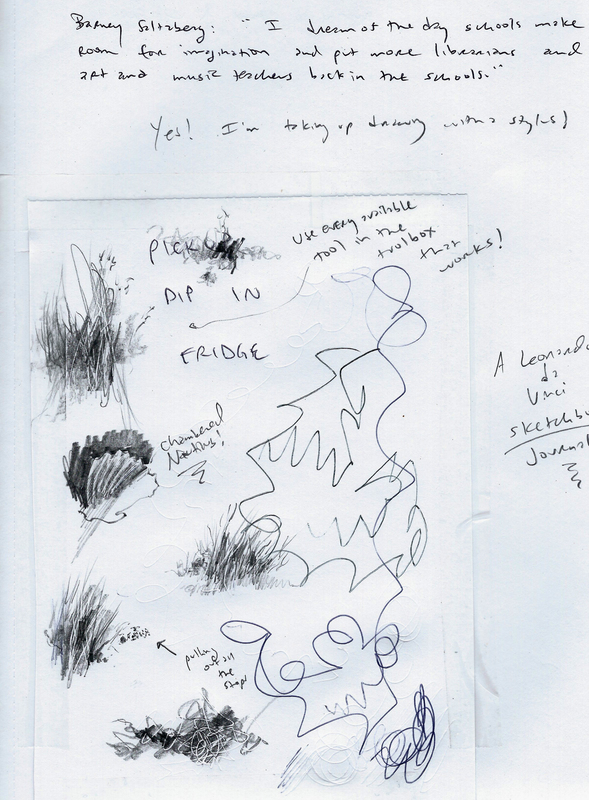 I am still exploring the possibilities of indenting the paper surface with a dried-up ballpoint pen as a stylus, and then rubbing soft graphite and blending stumps over the top, to see if I can render the semblance of grass and flower patterns. I posted this morning’s example above. 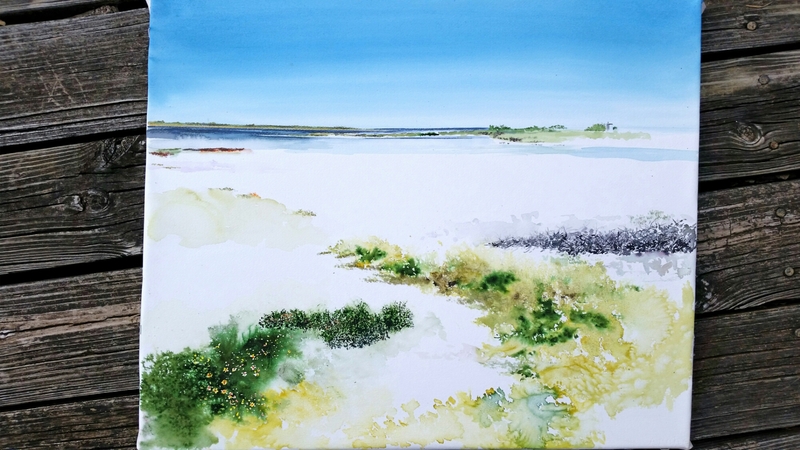 I believe that with a little tweaking, I can turn this blob of color into a bed of firewheels and assorted wildflowers from the Texas Laguna Madre. The first day of school was largely successful. Of course, I rose at 5 a.m., because I always have trouble sleeping the night before day one. By the time the day was done, I was totally exhausted, which came as no surprise. I put in a number of hours this evening, working out details for tomorrow’s classes. But then, I brought it all to a halt. I have resolved that I will no longer allow my life to be frittered away by minutia. I worked out the broad assignments for tomorrow, and then decided to give the rest of the evening back to myself. 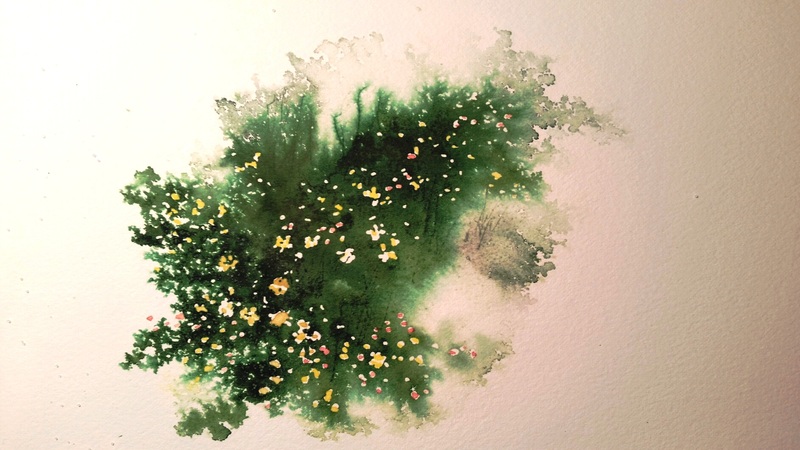 I have posted a portion of the lower left hand corner of my large watercolor. This portion measures about 8 by 8 inches. There is a good deal of masking underneath the wet surface that I will not be able to remove until tomorrow when it’s dry. And now I read and write in my journal with genuine pleasure, as I await sleep to take over. It has been a good day, thank you so much for reading. To fend off the crowd, Stoics believed, it was essential to cultivate inner self-sufficiency, and Seneca returns to this notion over and over. Learn to be content within yourself, to trust your own instincts and ideas. Those who achieve this autonomy, he argues, are best able to enjoy and make the most of their outward lives. They thrive in the crowd because they’re not dependent on it. Within you, there is a stillness and a sanctuary to which you can retreat at anytime and be yourself. 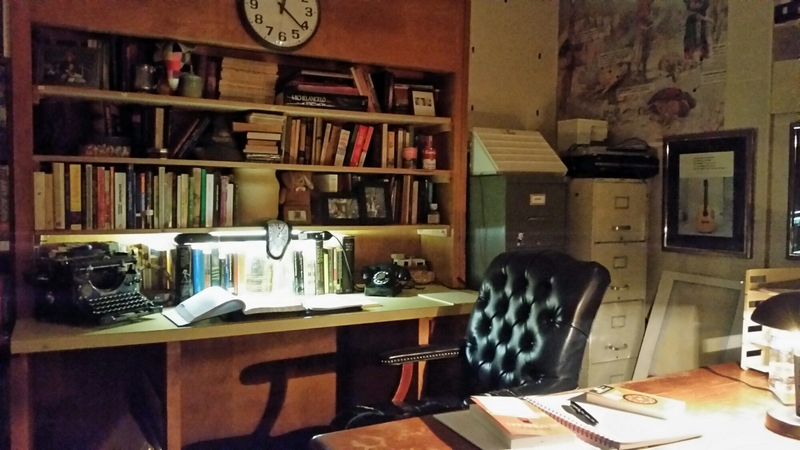 The photo above was taken early Saturday morning in the back of my darkened classroom, and it became a sacred space for me. Nearly three months of summer solitude and quiet are about to end as I enter the public classroom arena in the morning and write the first page of a new chapter for all of us. I’m choosing the title above because I have torn off and discarded a number of teaching points I have grown to love over the years, replacing them with some new ones. This latest book I’m reading Hamlet’s Blackberry: Building a Good Life in the Digital Age has seized my attention and held it like no other in recent years. Not only am I appreciative that the author got my attention of how social media can drive one’s personal agenda, I am glad now to seek a more satisfying lifestyle that balances my quiet solitude with the demands of a social business schedule. The summer has furnished an excellent training ground for the quiet side of my life, and tomorrow I’ll find out just how successful I am at balancing the tumult of daily school with the quiet of my study. I find such attractive sweetness in the lives of Emerson, Thoreau, Annie Dillard and Aldo Leopold because I imagine them to have found ways to balance their quiet inwardness with the demands of business. I see them as very positive role models for anyone who wishes to pursue creative exploits. I did fight for some painting time in the studio this day before school begins. 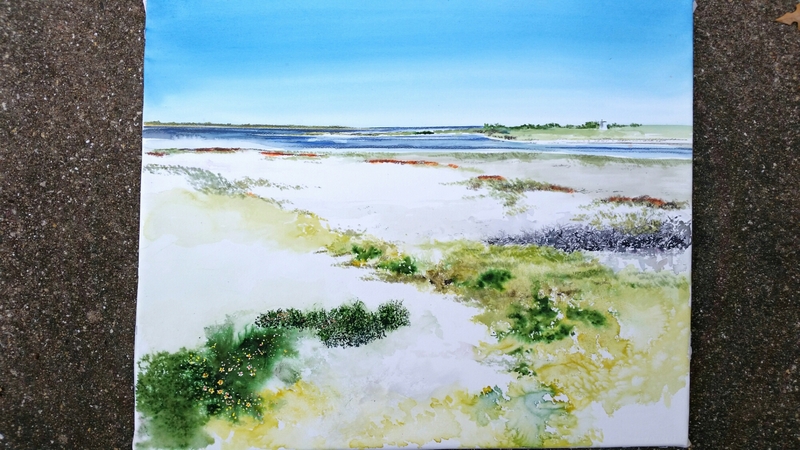 Here is a 20 x 24″ beginning of the same Laguna Madre painting that I completed a couple of days ago. I want to explore the serpentine countour of land in the foreground as I did in that very small watercolor. To get this effect, I used an empty ballpoint pen for the impressions into the paper, then skated over it with a 6B pencil and rubbed some of it out with a paper blending stump. 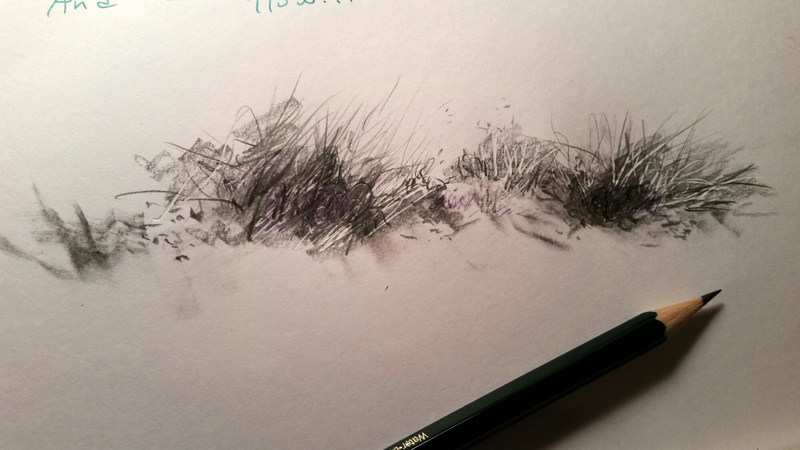 Finally, I drew in darker grasses, first in 6B, followed by a #2 pencil and then finally a 6H. I’m getting closer to what I want to accomplish. Too bad I have to break this off and return my attention to tomorrow’s first day of classes.